The Define universal iPhone and iPad app brings an interesting perspective to understanding the meaning and context of words. A Define: word search in the app brings you the definition from several different online sources, as well as relevant Wikipedia search topics and IMDb movie and television information. The Define universal download is also a great tool for making literature homework more fun. The standard practice, particularly among elementary students, is to work with the same set of vocabulary words all week. Define makes the process less laborious and more engaging. The Define universal download has a super simple interface. There is a search bar at the top of the screen to add your word. Just below the search bar, there is a bar with each month listed. For each month of the year, you watch your list of searched words expand. With a touch on your iPhone and iPad screen, a month’s list appears. When you search for a word with Define, you are basically creating streamlined Google search results. You are filtering out ads and items that are not necessarily pertinent. Define’s iPhone and iPad app saves you time by eliminating scrolling through a long list. It presents relevant definitions, word history, illuminating facts, and insights. For each word, you have several different online sources for the definition. When you touch a search result, it pops up without browsers and content fills your screen. A list of Wikipedia topics is generated. You can scroll through the list and touch the one of most interest. It’s quick, efficient and productive. Wiktionary and IMDb info are available with a touch. The IMDb access is a bit unusual and unexpected, but crossword puzzle fanatics frequently need television and movie information. For $0.99, the Define universal app download filters through internet fluff to get you the definition and the most valuable insight into a word, television, or movie. As a no-frills workhorse, the Define universal download brings you efficiently organized data from a variety of sources and gives a cohesive, clear, intuitive functionality to uncover more information easily. 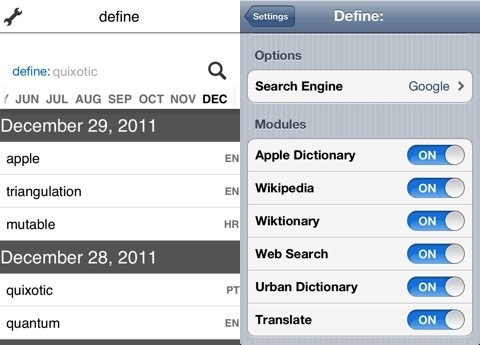 AppSafari review of Define: was written by Jenni Ward on April 9th, 2012 and categorized under App Store, Education, Reference, Search. Page viewed 3964 times, 1 so far today. Need help on using these apps? Please read the Help Page.